"Why would a man in his 60’s decide to change into a woman? 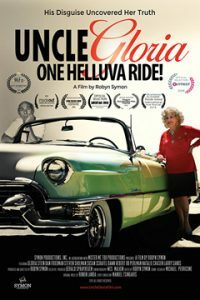 That’s the question the documentary Uncle Gloria: One Helliuva Ride tries to answer. Set in Florida the movie follows Butch from a tough guy who runs an auto salvage business to a darling who just wants to be free from all that male stuff. Butch has been married three times and with his first wife he had two children. With his second wife Shirley he stayed married for 21 years. One day Butch said he snapped and decided to divorce Shirley and she took him for all his money and even the pre-paid cemetery plots. Disgusted with it all Butch decides to become Gloria Stein, choosing the name from a combo of Gloria Estefan and Gloria Steinem."